In a pan add chicken pieces, ginger paste, garlic paste, tomato sauce, chilli sauce, soy sauce, pepper powder and salt and mix well. Add 1 1/2 cup water, cover and cook the chicken pieces for about 10 minutes. In another bowl, add plain flour, beaten egg, pepper powder, turmeric powder, salt and water and make a loose batter. Dip the chicken pieces in the batter and roll it in bread crumbs. Heat oil in a pan, deep fry the chicken pieces till crisp and golden. Serve hot.. So crispy n yummy fried chicken. They are so crispy and tempting Shabbu. Looks yummy.....crispy and delectable one. first time here....SO tasty recipes here,just as the name suggests! Keep up the good work..Following you,pls take time to visit deepsrecipes.Thanxs,Shabna..
Mouthwatering here, wat a terrific crispy fried chicken. What a nice and crunchy chicken..looks so delicious and inviting..
Mouthwatering... Tempting me... yum !!! 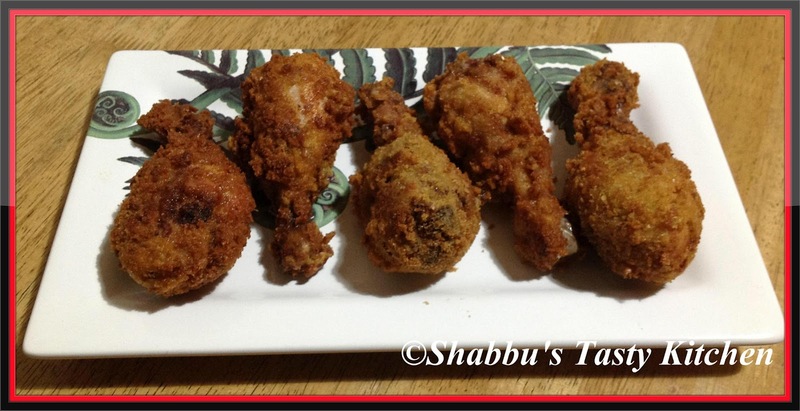 crispy and delicious chicken... mouth watering!! Hi, just want to say i like the look of your fried chicken. Looks delish and certainly a great Ramadan Recipes . Good luck on your entry and more power to your blog!